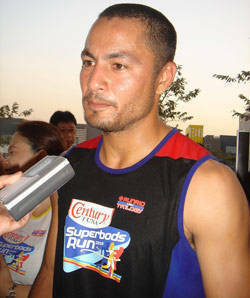 Gorgeous celebrities, led by Cosmo hunk Derek Ramsay, work up a sweat for children and health--and a beach-worthy figure. More than 11,000 runners gathered at Bonifacio Global City, Taguig recently to participate in the first metropolitan Superbods Run hosted by Century Tuna. In the past years, the tuna brand has been hosting a Superbods competition by the beach, but this year, they kicked off the festivities right in the heart of the metro. "By holding our Superbods event in Manila, we want to send the message across that one can choose to be fit and healthy regardless of the season and setting. The Superbods Run is the perfect venue to kickstart a healthy lifestyle—not just for summer, but the whole year through," said Century Tuna's senior product manager Angela Gamboa. The run, which is in collaboration with running coach Rio de la Cruz of RunRio, is a fundraising event for the benefit of the United Nations Children's Fund and the World Health Organization. Aside from the challenging 3K to 21K race routes, other activities like the capoeira and yoga exhibitions were also in store for participants, to promote a fitter and more active lifestyle for Filipinos. Among the celebrities who stretched their legs and ran for health and great causes were Cosmo cover girls Iza Calzado and Rhian Ramos; Cosmo Centerfolds Victor Basa, Jon Avila, and Derek Ramsay; and Maricar Reyes, Rafael Rosell, singer Karylle, and model Georgina Wilson, among others. "I wasn't supposed to run today, to tell you the truth, but with the amount of people here, how could I not? I just wanna come out here and run," said a smiling Derek, who was still recovering from a knee operation done 10 days prior the event. Despite his injury, the hunky health buff easily finished the 10K run. "It was fun. I met a lot of people along the way and I worked up a sweat. It was a great way to start the day." Click through to the gallery below to check out pictures from the event.